It took almost 5 months, but I’m finally here with my first full review of a 2013 movie. Yeah, I sorta reviewed Olympus Has Fallen [HERE], but that was mostly so I could make fun of it. 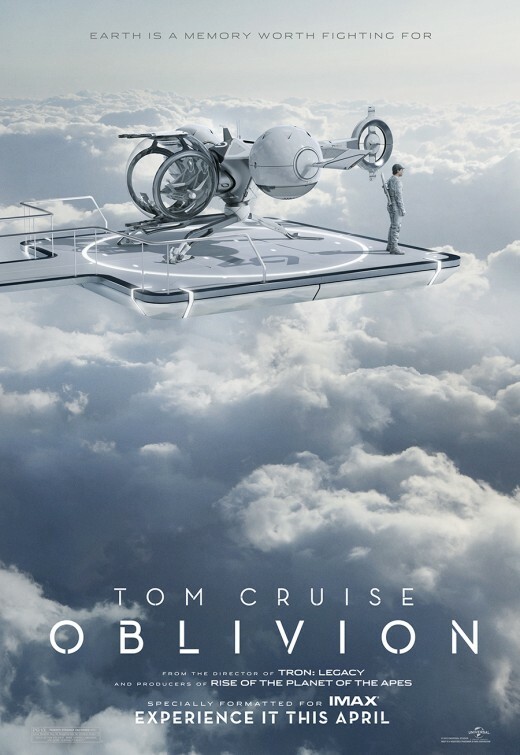 Oblivion is worthy of an actual review. It is a semi-thought-provoking (high praise! ), beautifully crafted and designed sci-fi film with some cool ideas and a few new twists on some old genre concepts. This is the second film from director Joseph Kosinksi, a former commercials director who made his features debut in 2010 with one of the most overhyped movies of all-time, Tron: Legacy, an interesting looking but ultimately disappointing film. No matter that film’s storytelling flaws, it was abundantly clear that Kosinski has talent and was worthy of getting another shot in the big-budget arena. He shows that again here. It also doesn’t hurt your prospects when Tom Cruise agrees to be your leading man.